The Truth about Dry Eye, Water and the Cornea. Corneal damage could begin with water loss from the eye's protective tear film. "Ocular dryness (dry eye) can deplete corneal stem cells, which are not replaced." Nearly everyone experiences dry eye and eye dehydration symptoms, including infants. Dry eye caused by dry air is the number one reason for United States eye doctor visits. Most people in the world do not take the condition of dry eye seriously. Sharon Kleyne, water and health advocate, Bio-Logic Aqua Research Founder, and host of the Sharon Kleyne Hour - Power of Water radio talk show, hopes this new educational discovery will motivate the public to become more proactive in taking better care of their eyes - and the water in their eyes' tear film. The importance of water in alleviating dry eye symptoms and maintaining corneal health was discussed during two on-air interviews by Sharon Kleyne, with Harvard Corneal Researcher Dr. Ula Jurkunas (July 11, 2011) and with Lasik pioneer Dr. Marguerite McDonald (June 1, 2009). Doctors Jurkunas and McDonald strongly agreed with Mrs. Kleyne that loss of water in the tear film is the underlying cause of dry eye. Replace the lost water and the condition, if not too far advanced, could begin to heal. According to Dr. Jurkunas, "It is important to keep the cornea clear and hydrated. When the tear film is too dry, the cornea becomes somewhat irritated and opaque." According to Dr. McDonald, "When the tear film lacks sufficient water, small corneal ulcers can begin to develop within hours. When the water content is restored, the ulcers heal fairly quickly. If water is not restored, the situation could become much worse." Production of corneal stem cells is essential to the healing of corneal ulcers. According to Dr. Jurkunas, "Corneal stem cells originate in the conjunctiva (the fleshy inner corner of the eye) and migrate across the white (sclera) to the corneal epithelium (the membrane covering the cornea)." Dr. Jurkunas explains that chronic dry eye, eye infections, severe eye allergies, the overuse of contact lenses and several other conditions, can lead to a permanent impairment in the production of corneal stem cells. This is called "corneal stem cell disorder." Dry eye disease is a health crisis in the United States and globally that can lead to severe eye discomfort, loss of work productivity, stress, fatigue, impaired vision, and, ultimately, blindness. 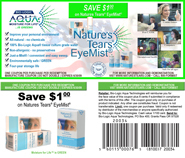 Dry eye and tear film dehydration can be caused by numerous environmental conditions, including dry air (low humidity), polluted air, improper diet, lack of sleep, warm weather, wind, perspiration, insulated walls and windows, forced air heating and cooling - and not drinking enough pure, 100% water. Both Dr. McDonald and Dr. Jurkunas strongly agreed with Sharon Kleyne's concerns about the global dry eye crisis and her assertion that "good hydration equals good vision."